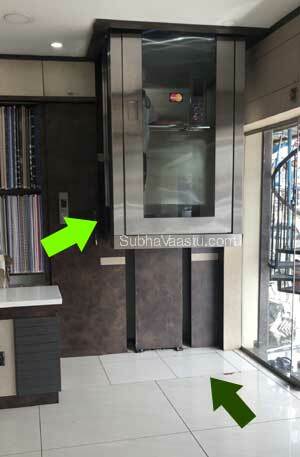 Vasthu Shastra Tips for Lift | Elevator: Mechanical or automatic lifts/elevators are common in Apartments. Some shopping complexes we may find escalator/conveyor/dumbwaiter, in some Factory, we may observe conveyor belts to lift the raw materials or production stocks. 1. Passenger Elevators. and 2. Non-Passenger Elevators. Hoist elevator, steam elevators are not in use. Nowadays arranging elevator in homes may be common. Due to health grounds some residents planning lift in their homes. Before finalizing the lift the Vastu House Plans should be verified by an expert. Some residents erect elevators for the status. In some apartments, we may observe personal lift facility to the flats but its few in number because of heavy cost. Please note that lift should require depression / sump / pit / hole / hollow ( in some areas these words are also using for lift pit like chasm, trough, excavation, rut, abyss, cavity, pothole, gulf, crater, pitch) but the common word is lift pit. Here this lift pit plays a role in creating the place for elevators. As most of us know that pits should not come at South, West and Southwest quadrants. If there is water storage sump at Northeast quadrants, then this small lift pit can be accommodated at Southeast or Northwest corners. 1. Southeast place is good for an elevator. 2. Northwest area is also good for keeping lift. 3. On some conditions, North is also acceptable for this lift position. 4. One certain condition, East direction is also acceptable for lift position. 5. If there is no land digging for the lift, then one may happily plan the lift at South direction. 6. West is also suitable for the lift, if there is no land digging for lift then residents can happily put elevator at West direction. 7. Don't Plan lift exactly at Northeast. 8. Southwest is not the right place for lift. 9. Can Brahmasthan is the right place for planning for a lift. Based on the other allocated structure of that area then only has to decide. Otherwise no. Technology is daily improving, in each and every subject technology is admirably enhances its new features. Previously elevator means, for the elevator landing purpose we are digging some area. Nowadays, home hydraulic lifts introduced. For viewers understanding purpose, showing one elevator which is running position from first floor to the ground floor, so half of the lift is visible. Please observe two arrows pointing two things here. One arrow is showing floor which there is no any elevator pit. Another arrow is showing that the elevator is coming to the ground floor. Revolutionary change in this lift mechanism. Excellent usage facilitation to many homes. Those who don't like to have pit for lift in their homes, then they may try this kind of hydraulic lifts. Residents may plan lift at their Home, but it should be properly planned. Most of the residents are placing lift at wrong directions and suffering from severe problems. (This matter is from subhavaastu.com). They spent crores of rupees for construction and decoration, but they are failed to contact one experienced Vastu consultant, may be their fate is not accepting. In residential lifts, the material gauge is not too heavy, but in commercial lifts, the metal gauge is heavier and structure is also a little bit different. They are bigger and providing for 4 to 12 persons also based on the usage. But in residential lifts, they provide only 2 to 4 persons. So before buying the lifts, we have to check how big it is and how facilitation we require etc, the price range is also a difference based on the size and quality. Some residents planned to fix the lift at Southwest direction, West or South directions, Southwest is not at all suitable, regarding West and South already we discussed above. Why....for placing lift at any corner or any place in the Home, we must provide a ditch there. Otherwise, the lift cannot be fixed in that place. Digs (pits) were not suitable and should not come towards Southwest, South and West directions. For hydraulic elevators, residents can have the lift at South and West directions, for other mechanisms which have elevator shaft then without vastu experts opinion don't plan at South and West directions. If the pit flooring level should be elevated than the flooring level at Brahmasthan. For this point of discussion, one expert Vastu Consultant recommendation is highly appreciated, so consultant one Vastu Pandit and show the property, he will explain the exact point to be placed for the elevator. This is an animated image. It takes atleast 5 to 6 seconds time to show its effects here. Once the animated image is appeared here, then check green color areas are the appropriate placements for the elevators, the green Color may be suitable to fix lifts. The red color shows that we should not plan elevator at these locations. In some cases we too given idea to install lifts at West and South directions based on the property structure and elevating the floor levels. When we are planning to install the lift at West/South we should think about digging a pit for lift. Generally, pits towards West/South are not good. By seeing this rule we may plan the lift not to be planned at exact ground level, we may climb two steps to reach the lift, at that time pit is not required, all should be properly planned otherwise modification may not be possible if any mistake took place. For Hydraulic lift there is no such rule of West and South directions. But don't plan the elevator at Southwest. Getting proper suggestion from Vastu expert is good idea in this regard. Is the main door can face the lift. is this good or bad? Actually, we are providing the answer after keen observation of many people experiences, otherwise, we don't like to publish at this website. Previously there is no apartments, only independent homes. Later apartment culture started and using lifts is mandatory, otherwise, residents cannot climb the top floors easily (Getting stairs is not an easy thing). An apartment means, there are several flats in each floor. So whatever the advantages or disadvantages will be equally shared to the same flat users of each floor. If a West facing flat resident has lift exactly opposite to his main entrance, that will be exactly same to the above floor west facing flats too. If there are 14 floors in an apartment, then all the West facing flats have exact placement of lift will be opposite to their main entrance. So the benediction or hindrances will be equally shared to all the East facing flat residents. In this case, we have collected a large data from various residents in apartments, we did not get any complaint from anybody on this lift placements. Subbarao from Visakhapatnam had exact Southwest lift, indeed he got promotions and his kids developed like anything in his flat. Narendra from Bangalore is very good when he had lift exactly opposite to the door, which came to West direction. His flat is West facing flat. Vijay from Guntur sold his flat, his flat is East facing and lift is exactly opposite to his main entrance door which is perfectly Northeast to his home. We observed 3 floors apartment which all these East facing flats are coming for sale or residents are suffering from problems, all these 3 flats have exact Northeast lift. By naked eyes, the lift is not at all creating any problem to this residents. The problem is this flat has East and South walks. Southeast corner flat. Basically, there is a lot of observation required when buying the flats. It's the reason many expert vastu consultants stated that personal visit is the only best option. Online vastu consultancy is not a substitute for the personal visit. Ram Mohan (from Hyderabad) has South facing flat, lift is towards South, before joining this flat, he got fear to buy it. Later with some vastu consultants advice he bought the flat with many doubts. But he got good profits in his business in this flat only, later he bought one big plot and constructed his home there. He never faced any challenges in this South facing flat. Sudhakar from Bangalore bought a West facing flat, lift is exactly opposite to the flat entrance. After 4 years in this flat he upgraded to another villa. He never faced any problems in this property though lift is exactly opposite to his flat entrance door. One thing we should all keep it in our mind that "not all homes are the same, there are many variations which only find by experts". So better to approach one of the best vastu experts for a personal visit and obtain his guidance before taking the property to buy or even for rent too. Generally, residents thought that, the comparisons are suitable to or equal to all the properties. But it is not like that. Not only lift position, but we should also check several things before buying. The question may be simple, but the explanation is very lengthy, otherwise, readers cannot understand the original concept of the subject. Regarding other vastu mistakes in home, we can certainly do corrections. But coming with lift, we may not do corrections. So becareful before installing life. Once lift erection is completed, don't search for remedies or solutions, some times there may not be any solutions for human mistakes. Caution should be taken in this regard. Total how many street focuses are there? Vastu consultant in Virginia, need vastu help? Need to know best places for staircase in home? Three burners stove in kitchen create any problem? Which part of bedroom is best suited for keeping cot? Wish to know about vastu shastra effects explanation? Farm house vastu, how to know more info on this subject? If crow crossed through inside of home, shall we vacate house? Had much curiosity on Palmistry, can I get some minimum content? & southeast of my neighbours flat, is it ok, as per elevator vastu shastra. sir, a lift is being constructed in the north east direction of my house earlier there was temple place so how to correct that place. please give me the solution for that as soon as possible. My Flat is north facing .I live on the 2th floor. There is a lift right opposite my front door. The lift door faces my front door. From the time i moved to this flat i have incurred lot of expenses. Can I remain in this same flat or should I move out? My Flat is west facing and even the building faces the west.I live on the 7th floor. There is a lift right opposite my front door. The lift door faces my front door. From the time i moved to this flat nothing good has happened. Can I remain in this same flat or should I move out? We live in a 7th floor Flat and the elevator door is directly opposite our flat front door. Flat and the main building are both south facing. Is it good to live in the present flat or Should we shift to another Flat? PLEASE SUGGEST POSITION FOR EXTERNAL LIFT .